Paintings, furniture, prints, fabrics, ceramics, silver, wallpaper, houses, pets, and personal behavior… What could these seemingly disparate things have in common? For colonial British North Americans they all were significant and very visible symbols of social status. Through visual display, individuals fashioned identities and also announced their social class to their larger community. And the reverse was also true: people-whether rich or poor, male or female, or white or black-were accustomed to and skilled at discerning in each other the visual markers that conveyed who that person was. In a hierarchical society such as Colonial America, who you were-or seemed to be-was often a matter of reading what consumer goods you possessed, or lacked. 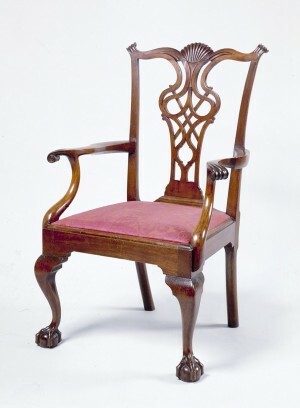 Think of objects in colonial homes in terms of their capacity to project an image of a person. For example, a portrait painter could convert the graceless into the graceful, add possessions that the sitter may not have owned, or eliminate something that clashed with the intended image. 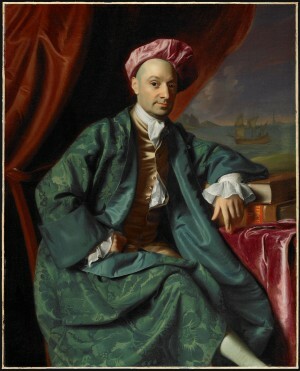 With that in mind, in this “Lesson in Looking” you will be asked to decipher some of the messages transmitted by visual means-in this case, in certain items of furniture and in portraits by colonial America’s foremost painter, John Singleton Copley. To discover and interpret these meanings, we need a set of strategies that will enable us to unpack visual images and consumer goods to decipher the explicit and implicit messages they communicated. In this “Lesson in Looking,” you will take a journey into the past where you will learn how to use those strategies to recapture a sense of how viewers in Colonial British North America understood visual images, and how they may have made connections that for us are now buried or unclear. In the process, you will learn some of the ways in which portraits and possessions “spoke” to viewers in the eighteenth century. There are a number of ways you can use this “Lesson in Looking.” Supplemented by a brief essay on the historical background of Colonial America and another essay surveying the visual media of the era, this resource is divided into three steps. Together, these steps demonstrate how visual media and objects shaped and were shaped by beliefs about status, character, and power in the years leading up to the American Revolution. Completing all three steps will take more than a standard class period, but will allow students to investigate a range of visual media and material objects, and assist them in understanding how they were viewed and used in the era. After examining several interactive images that model methods of observation and analysis, students will have the opportunity to offer their own interpretation of an eighteenth-century image. Suggestions for further reading and links to additional online resources will allow students to move beyond this lesson to apply their new insights and skills to other examples of historical visual evidence. Depending on the class and its focus, there are other ways to use this resource. One step (assisted by the contextual essays, suggestions for further reading, and Web links) can work as the focus of a single-class activity. Or one step may be the focus of an in-class activity with the following steps reserved for homework assignments. In short, this “Lesson in Looking” is designed to work in a range of classroom situations.